A few brief tips on navigating the website easily! On anything except small screens there is also a ‘breadcrumb’ navigation trail shown as below; you can click on those links directly to move back up through these levels. The current section has all its sub-pages listed in the right hand column – note that some pages may have their own sub-pages. e.g. on the Home Page the links will move to the main sections, i.e Parisj Council, Beat Officer, etc. They are more useful when actually in a particular section, for example, move to the 14th December report from the Beat Officer, and then you can read through each report in sequence. Note that once you move up a level, the Prev/Next links will move you through that level! 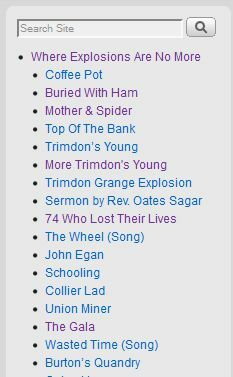 You can search for single words or names, or if you want to search for a name or phrase, enclose the phrase in quotes as such: “trimdon times” – this will show all pages that contain the phrase trimdon times. Remember, if you search for a very common term, e.g. Trimdon Station, you will generate an awful lot of results!! The Photo Galleries are held separately from the main website, even though it appears as part of it – if you need to search for names or information which may be attached to a photograph, please USE THE SEARCH BOX ON THE PHOTO GALLERIES PAGES.